Process industry diaphragm seal to combine with Bourdon tube pressure gauges. 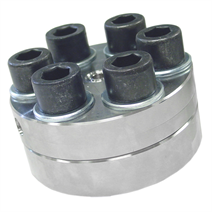 Intended for corrosive, contaminated, hot or viscous pressure media. Process industry chemical seal to combine with Bourdon tube pressure gauges. Intended for corrosive, contaminated, hot or viscous pressure media.